You may be surprised to find out that there are Bonsai in Bali and although they may be difficult to find they are well worth the visit. The first step is to find a "bemo" driver who understands exactly what you are looking for. Then trying to locate them is another problem as the streets are seldom named and I dont think they have heard of numbers, but this is part of the fun of it. 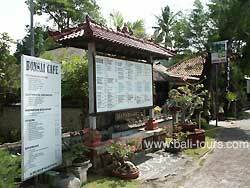 Most of the nurseries are located in Sanur close to one of the main tourist areas, probably the best place to start is Sanur Tropical Bonsai which is the Bali office for the Indonesian Bonsai Groups. 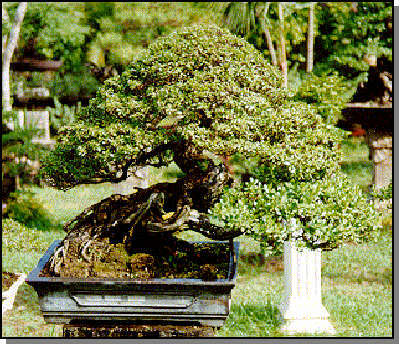 If you are limited for time it is also one of the largest nurseries with over 2000 Bonsai. Right behind this on the beach is the Bonsai Cafe where you can spend time browsing and talking while your family visit the Sanur beach markets just North of here. Many of the trees you see in Bali are collected, and are quite large and impressive, and some of the nurseries quite large. Common plants used are Casaurina, Pemphis Accidulus, Tamarind, Murraya and various Ficus Sp. Ceramic pots are rare as they are too expensive for the locals to buy. Some of the nurseries make there own pots from cement or buy them from a town called Kapal (this is the only town that has artisans that make them).